Freelancer Bianca Koch's torched BMW. A citizen journalist for a California weekly newspaper said her car was bombed in the early morning hours of Friday, Feb. 11, and now she has been asked to move out of her home. 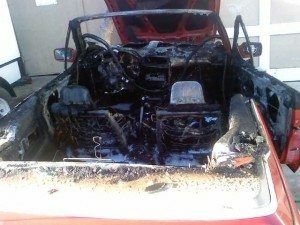 Bianca Koch, a resident of Ocean Beach and a freelance reporter who has had articles published in The Peninsula Beacon, said her 1991 BMW convertible’s top and interior were completely burned out and the exterior suffered substantial damage. One of Koch’s neighbors reported the fire about 5 a.m. to the San Diego Fire Department, which was able to extinguish the blaze within minutes after it began. Fire Department personnel on scene told Koch the fire was intentionally started. They said they found evidence of charred wood in the back seat and indications that some kind of accelerant was used, according to Koch. Some community members speculated that the torching was in response to articles Koch has written for The Peninsula Beacon, which some have interpreted to be favorable to the homeless. Glen Franks, director of Second Chances Bread of Life ministry that operates on behalf of the homeless in Ocean Beach, said there is some tension in the community between the merchants and those who serve the homeless. “Some of the merchants blame every crime committed in OB on the homeless, and they are not happy that we are feeding them,” Franks said. The torching of Koch’s car happened less than 24 hours after a front-page article about the treatment of the homeless, transients and disadvantaged appeared in The Peninsula Beacon , a weekly the covers Ocean Beach and Point Loma. However, neither Koch nor the police know of any connection between the controversy and the fire. He said Monday he was unaware of the torching of Koch’s car. “I’m sorry to hear about it – that kind of thing is not good for our community,” Alsobrook said. As of this writing, the San Diego Police Department is not involved in any criminal investigation. Koch said her car had been parked in its usual spot in an alley behind her home, next to several other vehicles and some buildings. Koch said Sunday her landlord has given her a 60-day notice to move out. “Now on top of losing my car and my business, I’m losing my home,” Koch said. For more information on the tension between merchants and the homeless in Ocean Beach CLICK HERE. To read an Ocean Beach blog on the issue CLICK HERE . I have to take issue with Mr Glen Franks statement that the merchants are blaming every crime in OB on the homeless. It is my observation that the merchants in this community have issues with certain incidents (aggressive panhandling, vulgarity, littering) but, overall, the merchants are comfortable with the way the homeless behave. I personally know of merchants who pay to have the front of their shops swept, litter removed, graffiti painted over & assorted odd jobs. The few merchants who are vocal about the homeless are not so ignorant as to blame every crime on the homeless and, would never condone violence. I feel for Bianca Koch and applaud her point of view. It did say “SOME” of the merchants…. Yeah, he did say “some” merchants, but he also said they blame “every” crime on the homeless. That’s just obviously a false statement. I doubt any any merchant, or any person for that matter, blames “every” crime on the homeless. Unless that person is a complete idiot and doesn’t know that 99 percent of crime in this town, and every other, is committed by people with homes, and jobs, and spouses, and children, and cars and guns. This sounds like a personal attack. Perhaps Bianca should look closely at her personal life for a possible perpetrator. Perhaps it is someone hiding behind the anger at the homeless, using it as an excuse to disrupt her life. Some very confused people out there. Based on my experience in OB last year, when I showed up to engage in a peaceful protest calling attention to how the homeless are perceived, I would say that the threat of vigilantism is very high. I would also say that it’s highly unlikely that any merchants would be involved; it’s more likely that such acts would be carried out by young people who’ve been influenced by the tone of the rhetoric used by OB’s homeless bashers. I was there too, and I agree…there was a pretty high level of ‘bashing, shouting, and pure anger’……… Merchants may NOT be in any way involved … most likely NOT. But, rather than get this into a merchants/homelessness issue, let’s stick to the real issue, and focus on the real issue….Homelessness, and the attitude toward it, and how as we as a community, individual can change that. As for Bianca, I feel for her. How terrifying and violating that someone would do such a thing. That’s terrible, and my best wishes to Bianca. No one should have to deal with that. The timing is also rather suspect with the article coming out. But as long as we are speculating wildly out of our butts, I am also curious as to why she is suddenly being evicted. Was it due to the incident, or something else? Because if there is some sort of dispute there between her and her landlord, over back rent or property damage or whatever… well… they’d be on my list of people to speak to if I am the police! Not saying… just saying. We hope to have an update and further information on this incident, so please stay tuned. Just wondering when she was told she had to leave the property before or after the car fire ? And what business did she lose that she referred to ? Let me get this straight; the SDFD have determined that this is arson, so the police are not investigating? Following that precedent, I can now torch cars without fear of arrest? What the hell is going on in this damn city? I gotta agree with Marisag’s posting above! When do we start to hold our elected official “deputy mayors” to a higher standard? Zucchet and Faulconner are ducking this story, being too busy right now trying to kick the VFW out of OB in order to kowtow to some local supremicists and me-firsters — the same type of elitist mentality that says car bombings are OK. Also, maybe these two could help us with the unanswered question of why this story has been suppressed in the local press so far? Stan just curious: where is the connection to her story in the Beacon and the car burning? is that a theory ? or fact ?? Having your car bombed and being evicted in the same time period seems like an unfortunate coincidence. That Bianca wrote an article about the homeless count during the same time period speaks to a level of resentment and violence that if connected is still probably in my opinion a personal matter. If an investigation turns up a merchant conspiracy, I will be freaked out, and my conspiracy gene will be strengthened. Thank you, Gary and everybody for the support. Hopefully you saw channel 10 news at 5pm, 7pm and 11pm and sometime tomorrow (saturday) morning. Channel 10 also has a link to the entire newscover for those who havn’t seen it. Also Christine Schanes interview with me might answer some of your Questions. And for Diane: I believe I have NEVER dissagreed with anybody enough to qualify having my car torched.-Also have I not once accused a specific group or person ( YOU said Merchants, NOT I), I’m just now starting to grasp, what actually happened. I believe the people or person who are/is involved dislike(s) my involvement in making people aware of problems and human needs within the homeless community that need to be addressed, NOT overlooked. I don’t find that worthy of committing a crime of this extent. And do NOT forget: we are ALL children of GOD, He makes no differences! Bianca, the people in the world who perform acts of terrorism are usually not people who are thinking about the world in a way which creates harmony. This goes beyond disagreement. Someone doesn’t like you, and they are willing to got to extreme lengths to show it. I hate to mention this, but that child of god statement can be inflammatory to the wrong individual. I’d say the Bianca herself would be the best judge of whether her past experience with commentary from the folks who dispute her approach to the homeless issue and her right to express her thoughts led up to the torching. If she has reason to link past innuendo and threat from a general climate of supremicism and hatespeach, well, we should accept it and go forward. She is one gutsy lady! Her landlady seems to see a link also. A landlord, generally speaking, may be able to terminate a tenancy relationship on 60-day notice (this is subject of a different blog on OB Rag site) but, being a landlord most of my life myself, I don’t know whether you can evict someone for the wrong reasons, even if you don’t have to cite those reasons. Caving in to terrorism may be considererd the “wrong” reason, especially to the “right” individuals! But all this is a side issue. More to the point I think the concurrent “eviction” of the VFW from OB and this firebombing should be discussed simultaneously. Can anyone tell me why Zucchet and Faulconer can interfere with a legal lease agreement signed by both landlord and tenant, demanding that the tenant leave town and the landlord be left stuck with an empty building? Where’s our traditional respect for property rights there? Older Article: Say, just how much did that ‘Fly-Over’ cost last weekend?